My travels often take me to places that remind me of the transitory nature of life. I’ve photographed ruins, abandoned castles, empty landscapes where communities once flourished. Time and again, I’m reminded that we are only here for a short while and that even the most powerful empires will one day come to an end. Panorama from 4 vertical shots, focal length 24 mm, aperture f/11, shutter speed 1/25, ISO 64, tripod. I was reminded of this again in Myanmar when I visited the ancient capital of Inwa. For more than three hundred years between the 14th and 19th centuries, Inwa was the country’s imperial capital. It served as capital far longer even than Bagan, the country’s famous ancient capital. Because of its importance, the grand city was repeatedly attacked, destroyed, and rebuilt. Inwa is a fascinating, mysterious place. Built on a manmade island between the Irrawaddy and Myitinge Rivers, it is difficult to get to, even today. There are no paved roads leading there, only dirt roads which are treacherous for all but the hardiest of automobiles and drivers. 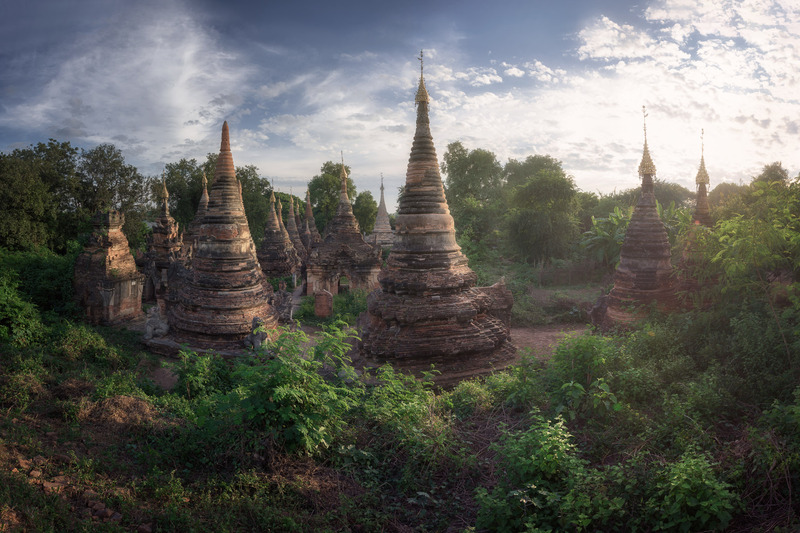 Locals — the brave ones, at least — take motorbikes and enterprising tour guides take visitors on donkey carts, but otherwise, Inwa is largely left alone, a far less visited site than Bagan and some of Myanmar’s other ancient sites. But I knew from having read about it that I wanted to see it, no matter how I had to get there. I visited twice, once with a driver who was undeterred by the unpaved roads and once by taking the ferry from Sagaing and walking. It was a trip that required some extra effort, but it was well worth it. Soon after entering Inwa, I found an ancient temple complex, long abandoned and nearly overtaken by vegetation. I felt as if I had entered another world, a forgotten but once splendid place. It was a quiet, still day; the only sounds were my footsteps and the chirps of jungle insects. Once a seat of imperial power, Inwa and its weathered, crumbling stupas were now a monument to the passage of time.